Enterprise customers are expected to snap up the Samsung Galaxy S8 and S8+ that hit store shelves today, given the phones' strong focus on worker productivity as well as security. IDC analyst Bryan Bassett predicted that "millions" of enterprise customers will buy one of the devices, some of them partly out of the pent-up demand created when the enterprise-focused Note7 was recalled globally after some units overheated and caught fire. "Samsung won't have any trouble selling these devices and they will do well with both consumers and businesses," Bassett said in an interview. "Business users are very eager to get their hands on the S8, especially after the Note7 recalls. They will especially want this slick and gorgeous device." Jack Gold, an analyst at J. Gold Associates, said that up to 65% of all S8 buyers will use them for business and work purposes at least part of the time. Samsung has reportedly set a sales target of 60 million sales of both versions of the S8, compared to sales of 52 million Galaxy S7's, according to unnamed Samsung sources quoted by The Investor in South Korea. Both phones, announced March 29, feature rounded edges and corners and an Infinity display that picks up the styling of the S7 Edge. Prices start at $720 for the S8 and about $100 more for the S8+, depending on the carrier. Both run Android 7.0 Nougat. While individual buyers might pick the device for its looks, the S8 will rely on the latest Knox 2.8 security and management that Samsung has promoted and improved over the past three years. Both Gold and Bassett said that one of the biggest selling features of Knox to IT managers is that Knox is supported by dozens of enterprise mobility management (EMM) software platforms globally, something that Samsung announced a year ago. Knox can also be used to extend encryption and other security to apps running on a phone, Gold noted. "The fact that Knox exists and can be managed effectively and secured by existing EMM products is a big deal," Gold said. The most secure phones in the Android ecosystem are made by Samsung and BlackBerry with its TCL-labeled BlackBerry phones. Samsung is also promoting a small dock device called DeX, sold separately for $150, that allows an Android-based desktop-like experience once the Galaxy S8 is docked and connected to a larger display, full keyboard and mouse. It could prevent an IT shop from having to buy a laptop or a tablet for a worker who travels a lot and relies heavily on a smartphone. 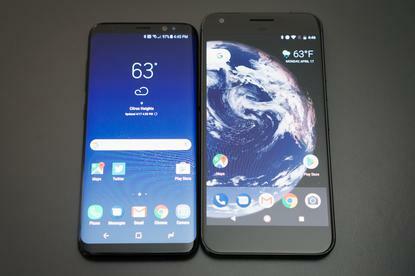 While the idea of a dock with a smartphone and larger display hasn't caught on with other similar products in the past, analysts said DeX could be purchased by up to 15% of enterprise customers who buy the S8. "Think of DeX as a replacement for something like a Chromebook," Gold said. Patrick Moorhead, an analyst at Moor Insights & Strategy, said he has been using the DeX already. "DeX is a great start to Samsung's modularity capability," he said. "It's not perfect, but has improved the craft." IDC's Bassett said that Microsoft's approach with Continuum, to run Windows productivity software potentially on all devices, even Android, makes DeX more compelling, even if it will be a niche device at the start. Buyers in the U.S. won't get the Bixby digital assistant in the S8 right away, but analysts said they don't see that missing feature as hindering many enterprise-related sales. While analysts agreed that iPhone will remain the top choice of enterprise users, Samsung's high-end Galaxy devices will come in second and will be bolstered by the S8. Four analysts said in interviews that Samsung's new battery safety testing processes should protect against any overheating problems with the S8. "Samsung really pulled out all the tops for a safe device this time after everybody was shocked, surprised and devastated with the Note7, which was hailed as the best until they had that battery problem," Bassett said. "The buyers who were not totally disheartened by the Note7 will come back to the S8, which is getting even better reviews," Bassett added. "Remember, Samsung had trouble getting people to send the Note7 back. Samsung has set its eyes on the enterprise, particularly with the S8. They will move a lot of devices for business users."